There’s a reason fish and chips exists: the combination of fish and potatoes is quite a thing of marriage. In any case, like Haddock on Smash or Unbattered Pollock & Chips, this fish and potatoes recipe is very much asian – Battered spicy beancurd-marinated sutchi fillet on sesame mash of potatoes, carrots and white radish, with sweet gem lettuce and calamansi. Set peeled and sliced potatoes, carrot and radish away to boil. When done, drain and let it steam dry in the colander for about 5 minutes or so. Then, mash with a knob of butter, a splash of milk, salt, pepper and a few drops of sesame oil. Marinate the fish fillets with spicy beancurd and dust with self-raising flour. Be sure to pat dry the fillets before doing this. Deep fry till golden brown. Cool on a cooling rack laid with kitchen towel. 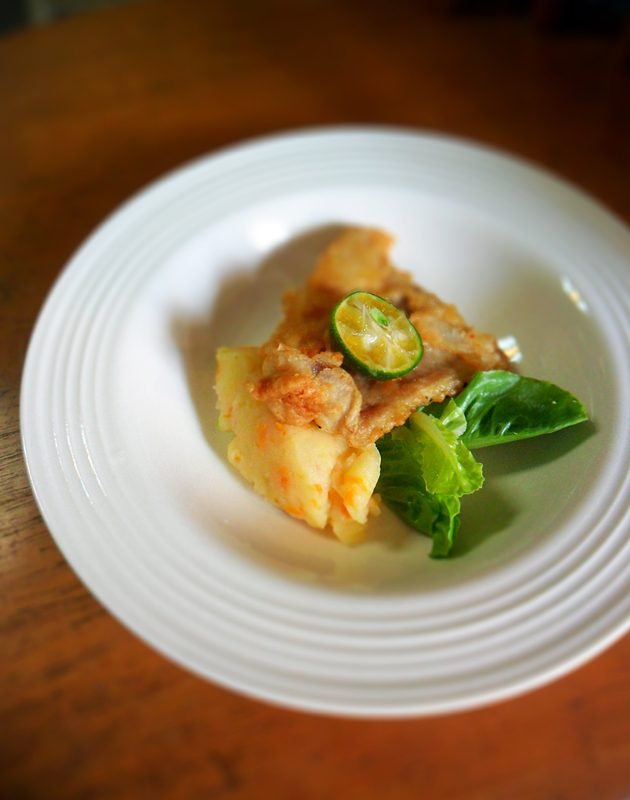 Serve all together with fresh leaves of sweet gem lettuce and half a calamansi for squeezing. Golden brown fried sliced shallots with the mash is a HUGE bonus. This entry was posted on Sunday, July 8th, 2012 at 09:12	and tagged with Asian, Fish, Mash, Potatoes, Sesame, Sutchi and posted in Asian, Fish. You can follow any responses to this entry through the RSS 2.0 feed.